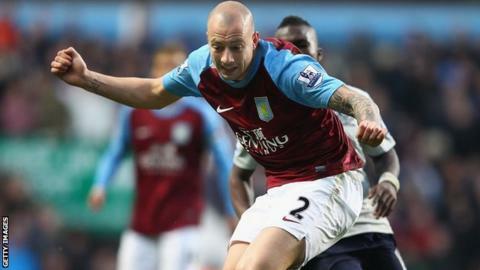 Real Mallorca have agreed to sign out of favour Aston Villa right-back Alan Hutton on loan until the end of the season subject to a medical on Tuesday. The Spanish side have the option to agree a permanent deal for the 28-year-old in the close season. Hutton made seven appearances for Nottingham Forest during a six week loan spell earlier this season. He will go straight into a relegation battle as Mallorca are 19th in La Liga, three points away from safety. If Hutton passes his medical checks successfully, he will become the only senior British player on the books of a La Liga side. The Scotland international has failed to impress since he joined from Tottenham for an undisclosed fee in September 2011, and has not featured in the Premier League this season despite being a regular under former manager Alex McLeish.